Thomas Mason: Engelse stoffen voor het laten maken van een overhemd. British inspired, with a touch of eccentricity, Thomas Mason collection is characterized by double twisted fabrics, crafted using only the finest yarns from the extra-long staple Egyptian cotton. Founded in Lancashire in 1796 by entrepreneur Thomas Mason, the eponymous label has been a landmark for elegance and quality, in the world of English shirting tradition. Acquired by Albini Group in 1992, Thomas Mason reinterprets its rich heritage in a modern and original way, through precious and colourful double twisted fabrics, crafted using the exceptional Giza 45 and Giza 87 Egyptian cotton and the refined linen from Normandy. Bases in linen and linen blends, cottons with strong colourful stripes, but also micro-gingham and tartan: the very British Heritage of Thomas Mason is openly declared for the Spring/Summer collection. Fresh, sophisticated fabrics in fine yarn counts, linen enriched with designs and colour: pronounced stripes, whether the classic micro-stripes picked out in pastel shades moving quickly to bold bright colours. The masterpiece of the collection, Amber, is a fabric made with an extremely fine yarn obtained by an intimate blend of cotton/linen, produced exclusively from the spinning mill I Cotoni di Albini, owned by the Group. This fabric is breathable and cool thanks to the best linen of Normandy and also has a soft and pleasant touch typical of the best cottons. In designing, stripes are the father of all, and these alternate with micro-gingham, tartans in bright and colourful madras tones. Also a lively seersucker effect. From the point of view of colour, the Spring Summer Collection of Thomas Mason is tinged overall in pink: a refined tone, a common denominator among the fancy checks and stripes. The Silverline fabrics of Thomas Mason are still being made in the traditional English way, and are sold worldwide. The collection, born in 1992, is a selection of classic two fold cotton shirtings, produced in the best tradition of fine English cloth with the best Extra Long Staple Egyptian cotton. The combination of a special twist given to the fine yarns, plus the traditional pure finishing method, confer a special lustre and softness, characteristics which make Thomas Mason fabrics quite unique in their class. Thomas Mason shirtings make their resultant garments stand apart, defining their style, enhancing their excellence and ensuring the highest quality of the end product. Shirts made in Silverline poplin soften with washing, and being both quick and easy to iron, thus combine practicality with the highest tradition of quality. During last update, Portland fabrics propose has been renewed in design, thanks to the usage of more brilliant colours, enriching the classic collection. The offer of Zephyr 1818 have been moreover widely renewed, broaden the number of varies and graphic propose, with novelty in colours, strengthening further the classic vichy and gingham. Silverline is the ideal choice for shirtmakers and total look customers who love a classic and eccentric style, typical of Jermyn Street. Goldline is the highest level Thomas Mason service program, which was created originally for the company’s bicentenary celebrations (1796-1996). The fabrics, on typical structures poplin, zephyr, twill and oxford, are realized with two folded cotton yarns 140/2 obtained from the best Egyptian cotton, Giza 45. Cultivated in a small area of the Nile delta, thanks to particular climatic conditions and the fertility of the earth, Giza 45 represents only the 0,4% of the total annual Egyptian production. His fibres allow to reach the fineness, the silky handle and the softness of the best shirting fabrics. Completing the collection is a precious collection of super white fabrics, created with the best Egyptian Giza 87 Cotton. 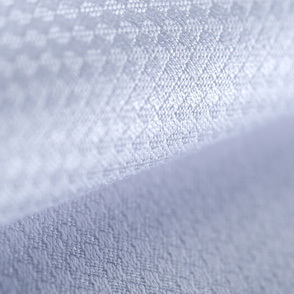 The Giza 87 fibre presents extraordinary and unique characteristics; the fibre being notably long and the brightness amongst the best of the Egyptian long-staple cottons, guaranteeing a particularly luminous and brilliant white. Thomas Mason exalts the characteristics of Giza 87, creating fabrics which do not degrade over time and, on the contrary, with each wash the fabric will return to its original silky handle: a feeling that can be proved every day when wearing a shirt of the Giza 87 Thomas Mason. High quality cotton alone is not enough. Groundbreaking technology and highly competent personel also contribute. Behind quality, exclusivity and sophistication is a brand that for generations has coupled craftsmanship and obsessive attention to detail with the complexities of an industrial production process. Particular attention is paid to the finishing processes in order to render the Goldline fabrics unique in coloration, luminosity and silky handle. To guarantee the maximum quality, a professional and experienced cloth inspector examines every single metre of fabric with a particular consideration. A fabric that has been created by joining one single yarn of two natural fibres, cotton and cashmere. This blend combines the very best features of the two raw materials: the lightness, softness and warmth of cashmere with the breathability, wearability and comfort of cotton. Blenheim is a collection of fabrics belonging to the Goldine collection with two-for-one twisted poplin structures 140/2, ideal for ceremonial fabrics. Buckingham is a two-for-one twisted 140/2 poplin fabric, characteristic of the Goldline collections. The designs reflect the classical themes. The Thomas Mason proposal that concerns the classical plain colours. Byron Kent is a two-for-one twisted 120/2 piece dyed poplin fabric. It represents the eternal American Pin Point, two-for-one twist 80/2, for a shirt with the traditionally casual taste. Canterbury is a collection of figured fabrics with the introduction of satin stripes. The result? A fashion shirt with an urban-like taste. Fabric with the classical Cavallery weave in two-for-one twisted 80/2 twill. 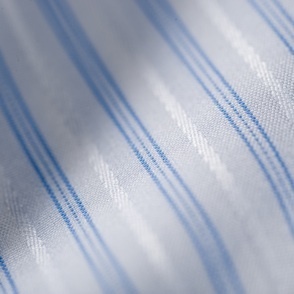 The tone-on-tone diagonal stripes are characteristic for an elegant shirt, sparkling, with a unique DNA. Chester, in other words the lightness of Zephir embellished by the etamine structure. This fabric is a collection of plain colours and stripes in all the cool pastel colours. 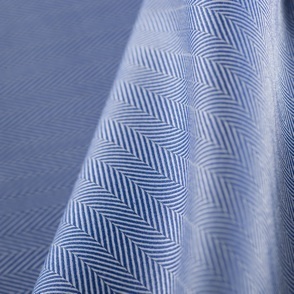 Clarence is a two-for-one twisted 140/2 piece dyed poplin fabric. It has a vast range of colours, particularly brilliant thanks to the preciousness of the fabric. Dobby is a big collection of whites in differently weaved fabrics for a classical, elegant and precious shirt, suitable for those unforgettable events. It is made from two-for-one twisted yarn 100/2. 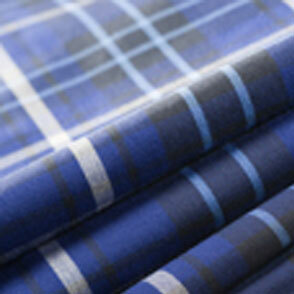 Durrants is a proposal with tartan patterns, brilliant colours and fashion combination of colours. Durrants is a cool and summer fabric, suitable for free time. This is a very compact poplin fabric, piece dyed, two-for-one twisted 120/2 that gives itself over to many different styles. Gold Linen is a pure linen fabric with a count equal to 90. It comes in plain and false plain colours as well as with classical designs. Gold Oxford of Goldline is a pin point with a 140/2 warp and a three-ply weft. It comes in plain colours and classical stripes. Hampton comes with twill, etamine and spiral structures in a two-for-one twist 140/2. The designs are classical to wear under a jacket. Herrin is the plain colour collection in two-for-one twisted 100/2 twill fabric. The herringbone twill weave is characteristic and original. A large collection with a decidedly sporty accent with tartan patterns on oxford and twill fabrics. Marcella fabrics are the ideal solution for Taxido shirt lovers with the classical honeycomb weave. Here's a typical American Oxford with a three-ply twisted weft. A wide choice of plain colours in the classical and pastel tones. Coloured stripes on a white or coloured background. Pin Point is an Oxford spin-off fabric. The effect is a fairly grainy fabric with a weft that appears to be made by an infinite number pinpoints. Thomas Mason's collection sees a two-for-one twisted 120/2 with classical and pastel colours capable of expressing a great personality. Piquet just could not be left out of the Silverline collection. It is a collection of two-for-one twisted 100/2 white fabrics made with various structures. This is the Piquet of the Goldline collection made with two-for-one twisted yarn 140/2. Pastel plain colours. Plissé too is synonymous with Tuxedo shirts: a collection of black and white fabrics, ideal for a ceremony where you certainly won't go unnoticed. Numerous proposals of two-for-one twisted 120/2 poplin ranging from plain colours to micro stripes, from coloured stripes to eccentric coloured backgrounds. The classical tradition of a great fabric for shirts with that typical touch of British eccentricity. 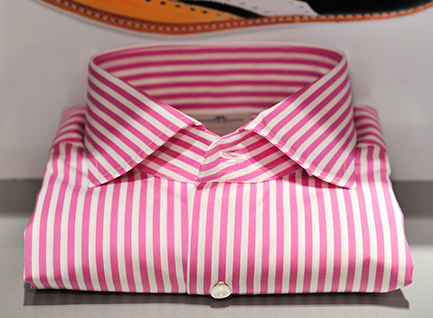 Another collection in poplin with 100/2 and 70/1 yarn, made with stripes in both classical and bright colours for a shirt that is able to let that strong personality appear. Two-for-one twisted 100/2 fabric with the Oxford structure, false plain colours, stripes and checks for an important quality collection. The Silverline proposal of plain and false plain colours, different size checks in twill and herring-bone, from the palest of hues to the more intense, made with two-for-one twisted yarn 100/2. Sandringham, included in Goldline, is a two-for-one twisted Zephir fabric 140/2. Classical designs for this collection. This is Silverline's characteristic item. It is a two-for-one twisted 100/2 yarn dyed poplin. A comprehensive range going from plain colours to the more classical designs and exploring graphics with bright and contrasting hues. Silver Satin is the Thomas Mason collection for those who love white, especially coupled with blue or black. A choice of poplin fabrics 100/2 with patterns added. Sovereign is a two-for-one twisted fabric 160/2, piece dyed used to make compact shirts with a silky texture. Another idea of the Silverline collection linked to poplin. St. James is a two-for-one twisted 100/2 piece dyed fabric. This is a two-for-one twisted fabric 80/2 with a great personality, plain colours and classic, masterfully enhanced by the twill and herring-bone weave. This is a very compact fabric zephyr. Article tip regarding the weight trousers. The pleasure of wearing a lightweight, precious fabric, impalpable almost like silk: a two-for-one twisted 100/2 piece dyed voile. Wimbledon is a refined poplin and offers a wide choice of colours. Zephir 100 is an important collection of plain colours ranging from pale hues to the more intense and with a "chameleon" effect in a two-for-one twisted fabric 100/2. The lightness of Zephir for a precise definition of tiny coloured checks. The ideal choice for who wants a cool and lightweight shirt.